As the conflict in East Ukraine enters another hot phase, residents of the rebel-controlled territories say they are now stranded due to a new travel permit system introduced by Kiev, while aid organisations have warned that a medical crisis could be on the horizon as Ukrainian authorities refuse to let through vital medicines. “Since November, a series of measures taken by the Ukrainian government has effectively cut off civilians living in rebel-controlled areasand made it increasingly difficult to provide humanitarian aid,” said a statement by Médecins sans Frontières. The organisation said it had tried to deliver medical supplies to hospitals in the frontline city of Gorlovka on two occasions last week and failed to get through. The situation will only be exacerbated by a permit system introduced last week, requiring anyone who wants to cross the line between Ukrainian-controlled territories and the so-called Donetsk and Luhansk people’s republics to apply for a special pass. Applications are only accepted in Ukrainian-held territory, with the catch-22 situation that those in rebel-held territories cannot get to the permit application centre because they need a permit to get there. Oleg Izmailov, a local journalist, called the new system “both idiotic and a breach of human rights”. The only option for residents of Donetsk and other rebel-held towns to obtain the permit is to drive to the first Ukrainian checkpoint and hand over the application to soldiers, explaining their reasons for wanting a permit. However, the soldiers only accept a few applications per hour, meaning people wait for hours in the cold to hand over the documents, and then have to drive back 10 days later to find out if they have been granted permission. On Monday morning there was heavy shelling around the checkpoint, forcing cars to turn back to Donetsk. “I wanted to get the permit so I could go to Dnipropetrovsk to pick up a parcel, I ordered spare parts for my car and the post doesn’t work to Donetsk any more,” said Andrei, a Donetsk resident who did not want to give his surname. Having waited for more than four hours at the checkpoint to hand over his application, he heard shelling and got scared, and decided to return to Donetsk. Officially, the move is to improve the security situation. Unofficially, part of the philosophy behind the move appears to be to demonstrate to those people living in rebel-held areas how miserable life under separatist rule can be, and it is also based on an assumption that most pro-Kiev people have already left the region. On Monday, Kiev announced a “state of emergency” in east Ukraine that is likely to make things tougher. However, many of the people remaining in the rebel areas are the most vulnerable – the old and infirm and those with nowhere else to go – and Kiev’s policies risk alienating them even further from Ukraine. While Donetsk markets are still reasonably well stocked – traders say they offer fruit and other foodstuffs to both Ukrainian and rebel soldiers as bribes to allow them through checkpoints – there are few locals with the funds to buy them. Ukraine has cut off pension and other social payments to those living in rebel areas and the rebel governments have been unable to pay more than symbolic amounts. In smaller settlements, people with limited mobility have faced difficulty in accessing foodstuffs, while many are living without proper heating or electricity for long stretches. Bank accounts have been frozen, and there is no way to access money in rebel-held areas. At Donetsk’s drug addiction treatment facility, doctors received their last shipment of medicines from Ukraine in September. Russia has stepped into the breach, and the clinic has received insulin, painkillers and other necessary medications from the humanitarian convoys sent by Moscow. But it has not received buprenorphine or methadone, because drug-substitution therapy is illegal in Russia. Earlier this month, the remaining 52 patients prescribed buprenorphine had their medications stopped, and while there are dwindling supplies of methadone remaining, doses will be scaled down starting this week, and will run out completely on 1 March. There are 155 patients remaining in the clinic on methadone, and 380 across the region. The doctors at the clinic have worked six months without payment, receiving one small subsidy from the new Donetsk rebel authorities. One nurse has left after her house was destroyed, but the majority of clinic workers have stayed, despite the lack of salary. Now they have to explain to the patients that their treatment will end. “The International Committee of the Red Cross just needs an official memo to take it across but we can’t get the documents signed,” confirms Pavlo Skala of the HIV Alliance in Kiev. The methadone is not even paid for out of Ukraine’s budget, but funded by a grant from the Global Fund to fight Aids, tuberculosis and malaria. All that is required of Kiev is to provide a document allowing for the drugs to pass through checkpoints. It has not been forthcoming. 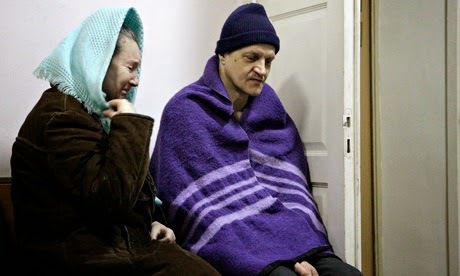 In December, more than 300 patients on methadone in Donetsk region signed an open letter to President Petro Poroshenko and Ukraine’s health minister, Aleksandre Kvitashvili, begging them to allow the supplies through. The patients wrote they would seriously consider suicide over “returning to street drugs and criminal life”. They have not received an answer.